It's pink week here at Mountain of Ink, so we are going to kick off the week with a bright magenta pink, Diamine Magenta Flash. I purchased my sample of ink from Vanness Pens. Magenta Flash is a bright magenta with silver shimmer and bright green sheen. The shimmer on this one is harder to capture in photos. To me, the shimmer looks more baby pink than silver, but according to Diamine the shimmer is silver. 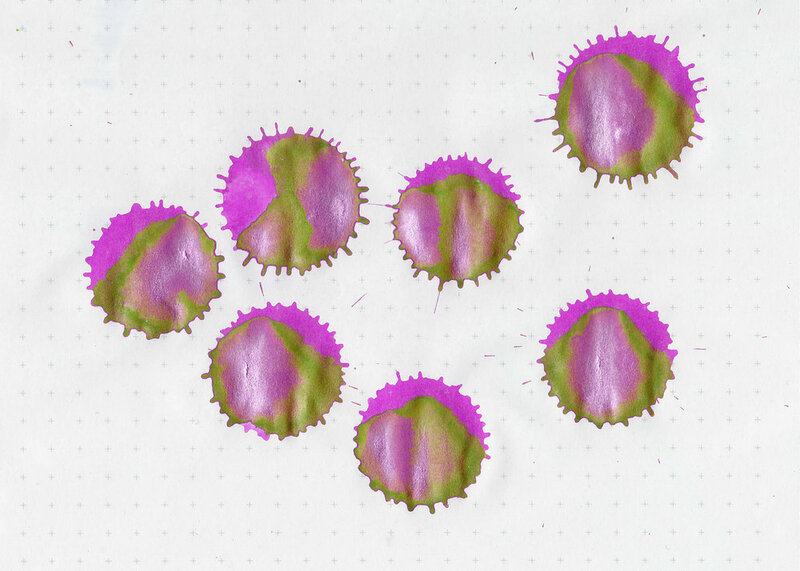 I was totally surprised by the bright green sheen that shows in large swabs and ink drops. Bleeding: Low-there was just a little bit of bleeding in the flex nib on Rhodia. Other properties: Low shading, low sheen, and silver shimmer. The green sheen only shows up in large swabs and flex writing on Tomoe River paper. 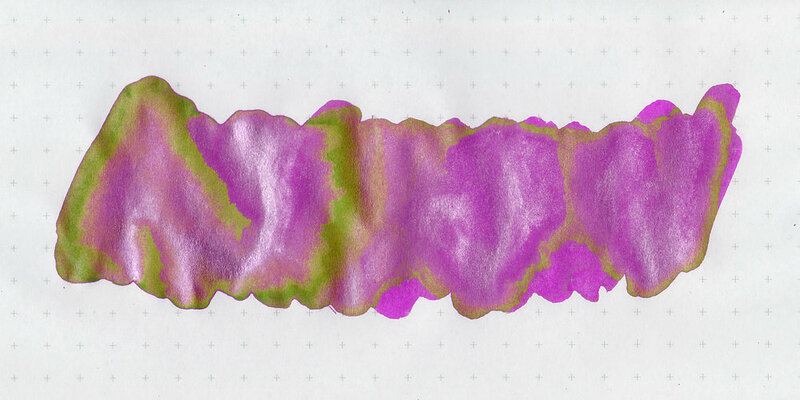 Ink swabs for comparison, left to right (top to bottom for mobile RSS): Diamine Frosted Orchid, Diamine Magenta Flash, and Diamine Electric Pink. 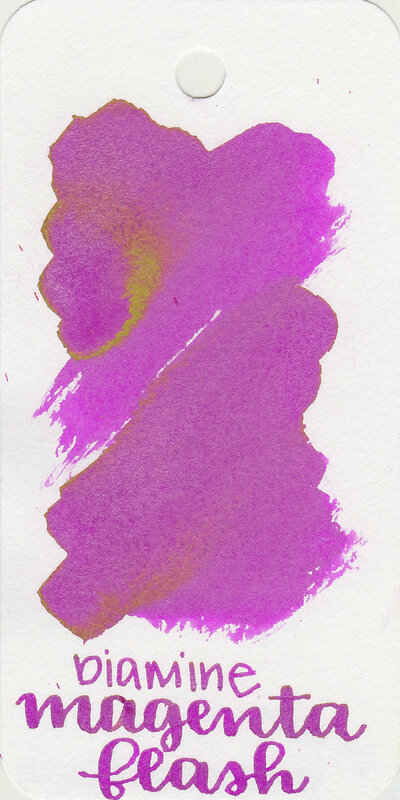 All three of these are Diamine Shimmertastics, Frosted Orchid is more purple, and Electric Pink is more hot pink than magenta. Callifolio Andrinople, Diamine Flowers Bougainvillea, and Diamine Claret. I think Bougainvillea is the closest to Magenta Flash, without the shimmer. Click here to see the pink inks together. 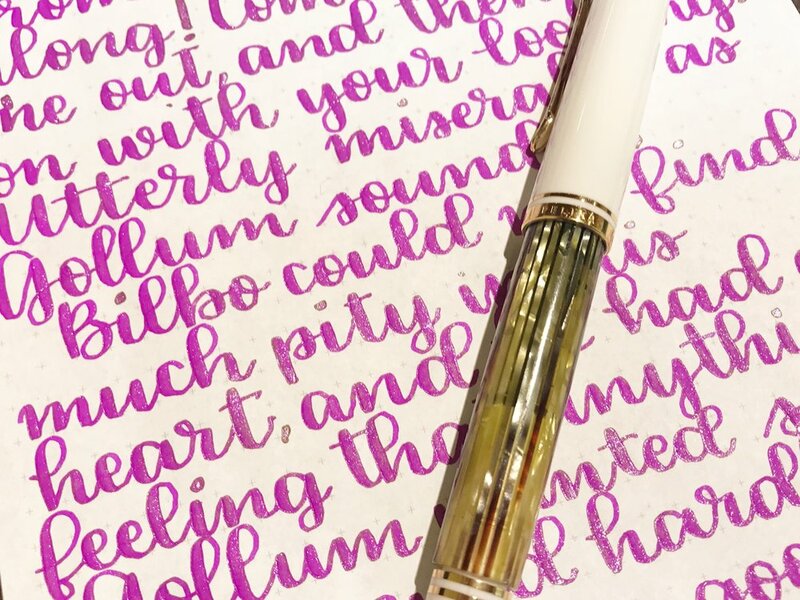 I used a Pelikan M400 White Tortoise fitted with a vintage 400N nib on Tomoe River paper. The ink had an average flow. The shimmer clogged the feed once, but I just primed the feed a bit and kept writing. I've come to expect at least one clog when writing with shimmer inks. Overall, it's a nice ink. The shimmer really does look more baby pink to me than silver, so it seems pink on pink, which is a bit much for me. I'm not crazy about the green sheen. It looks a bit vibrant to me, bright magenta with bright green sheen. I'm just not crazy about this one. Give it a try, you might love it.